The installation of a new kitchen sink can often breathe new life into a kitchen without the need for a large investment. Before purchasing a new sink, it is always a good idea to measure the old one. This will ensure that its replacement is an exact fit. There are many relatively cheap stainless-steel models on the market which are light, easy to install and very durable. Some people prefer porcelain sinks but they can be susceptible to chips and cracks. Both the hot and cold water valves to the taps should be completely closed; they are normally located directly underneath the sink. In situations where the sink has been in place for several years, there may be some corrosion on the valves, making them extremely difficult to close. It may be necessary to use a wrench or locking pliers to prise the valves open. When this is done, the taps should be opened to relieve any pressure in the pipes and the main water line should be disconnected, usually with a spanner or locking pliers. At this point, it is safe to remove the taps from the sink. Many sinks will have clips that lock the sink into place; they should be located and can usually be unlocked by hand. Using a box knife, the silicone or caulk that seals the sink against the kitchen bench should be cut away. 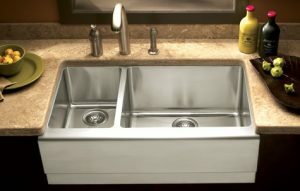 If the sink contains a wastage disposal, it should be completely disconnected from the mains before the sink is pulled out from its recess. Drainage pipes and attachments may vary, but most use a slip nut and gasket which need to be removed. Removing a sink can be a tricky process, particularly if the plumbing is old and corroded. It is always a good idea to have the telephone number of an emergency plumber close by; just in case. Once the old sink has been lifted out, the excess sealant should be scraped from the bench. As long as the measurements of the old sink were correct, the new one should slip perfectly into the recess in the bench. It is always a good idea to add sealant to the underside of the new sink before lowering it into place. The unit should then be locked into place and sealed against the bench with a silicone gel; this process will require the use of a dispenser gun. At this point the taps can then be put into place and reconnected to the mains water line. The drainage pipe should be reattached to the new sink with the connection assembly that came with it. If a waste disposal is in use, this can be reattached at this time and turned on. It is important to allow water to flow through the sink for a few minutes so that any leaks can be spotted and attended to. Most leaks simply require the tightening of a nut in the drainage assembly or at the point where the taps are connected to water mains supply. However, if you’d like your sink installed by a professional, Stoke-on-Trent Plumber can ensure a perfect installation at competitive rates. Call Stoke-on-Trent Plumber today!